As part of the preliminary design for the Green Line project, The City will be conducting a geotechnical field investigation from March to April 2016. Geo technical drilling will occur along the length of Centre Street from downtown, around Prince’s Island Park, Memorial Drive and up to Stoney Trail. The majority of the work will be occurring on City owned property, however, some work will happen on private property owned by Impark; The City has been granted permission to access this area. This field investigation involves rigs drilling into the ground at specified locations to obtain subsurface information and extract soil samples. To accommodate the work, a number of parking stalls may be blocked off. 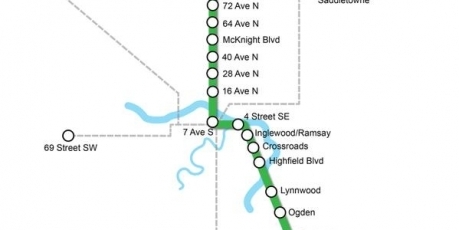 The Green Line will be a 40 kilometre long transit line, extending from Seton in the southeast to Country Hills in the north. Once constructed, it will nearly double the size of Calgary’s current LRT network, providing almost 300,000 Calgarians with reliable and efficient transit service. The Green Line will not only move people from point A to point B – it will be a staple of the communities that it touches, creating Transit Oriented Development (TOD) areas where people can live, work and play in close proximity to public transit. Green Line stations will be built for low-floor trains, meaning they will be small in scale and seamlessly integrated into communities with strong walking and cycling connections to and from each station. Thank you for your patience while we undertake this technical work. For more information about the Green Line project, please visit www.calgary.ca/greenline or call 311.